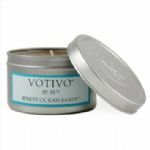 Votivo fragranced candles, Votivo diffusers, burning sticks, soap, handwash and room fragrance. Since its inception in 1994, Votivo has built a worldwide reputation for high quality home fragrance products. Their fragrances are famous for their ability to quickly fill a room with complexity and depth. In a world of mass production, Votivo offers distinctively packaged products that are handmade. Each candle is hand-crafted. Each tissue is hand-wrapped. Each pewter seal is hand-pressed.